In a recent decision in the case of Horst v. Union Carbide Corporation, No. 15-CV-1903 (C.P. Lacka. Co. Oct. 11, 2017 Nealon, J. ), Judge Terrence R. Nealon of the Lackawanna County Court of Common Pleas reviewed the scope of a trial judge's authority to impose limitations upon the length and number of opening statements, closing arguments, and examinations of witnesses pursuant to Pa. R.C.P. 223 and 225. This asbestos action was proceeding under allegations that the Plaintiff allegedly developed malignant mesothelioma as a result of the Plaintiff’s alleged exposure to asbestos-containing products that were allegedly manufactured or sold by the Defendants while the Plaintiff was employed by his father’s heating, ventilation, air conditioning, and plumbing business. The court noted that it had issued this Order imposing limitations on the trial proceedings after counsel had initially represented to the court that the trial of this matter would last three (3) weeks after which the Defendants more recently revealed to the court that four (4) trial weeks or twenty (20) days, would be required to present the Defendants' case only. Accordingly, the court noted that, in order to ensure that the trial would be completed within the allotted time that was originally fixed based upon the initial representations of counsel, the court entered an Order imposing limitations upon the length and number of the opening statements, closing arguments, and examination of witnesses. In this decision, the court denies the Motion for Reconsideration filed by eleven (11) of the twelve (12) Defendants in which the Defendants requested that all of eleven (11) participating Defendants be granted the opportunity through their respective counsel to present opening statements, closing arguments, and to examine all non-expert witnesses called by the Plaintiff. After reviewing Pennsylvania law in support of its decision and authority to limit certain aspects of trial proceedings, the trial court granted in part and denied in part the Motion for Reconsideration. 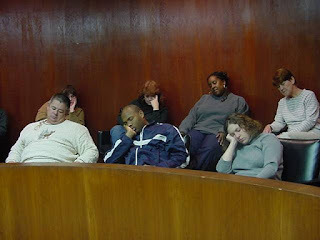 The Motion for Reconsideration was granted to the extent that the prior Order of Court was amended to provide that all Defendants shall be allotted and aggregated a period of 180 minutes within which to present and conclude all opening statements on behalf of Defendants as well as a same amount of time within which to complete closing arguments for all Defendants. In all other respects, the Defendants’ Motion for Reconsideration was denied. Anyone wishing to read this Opinion may click this LINK.